In just TEN days, it’ll be time for us Windsorites to go to the polls and select one mayor and one city councillor for the ward we live in. And statistically in these last ten days, this is when an election comes alive. 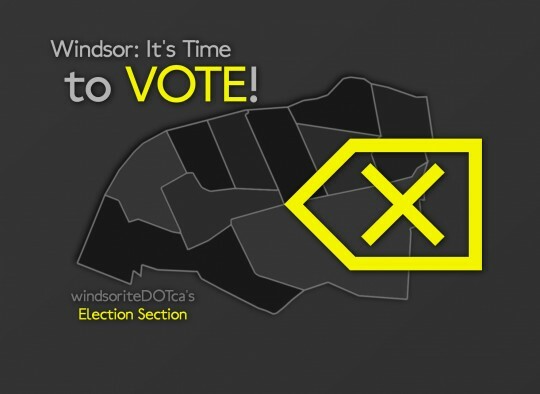 That’s why today we’re launching WINDSORITEDOTCA’s first ever Election Section! In August/September we conducted a number of email interviews with registered Council and Mayoral Candidates running in this Fall’s Municipal Election. Inspired by Vote Out Loud, the City of Windsor’s campaign to educate young voters, we brainstormed a series of questions that would help young Windsorites feel connected to Candidates in this election. We asked Candidates to list the top five issues in their ward, identify one major task they would tackle city-wide, talk about the future of Downtown Windsor and discuss what youth-specific approaches they would take toward the future of Windsor. And now we present these interviews to you, Windsorites, verbatim from the Candidates themselves.